Below are Box Office Collection Report of bollywood film Sachin: A Billion Dreams With his review, budget and total box office and worldwide collection status. 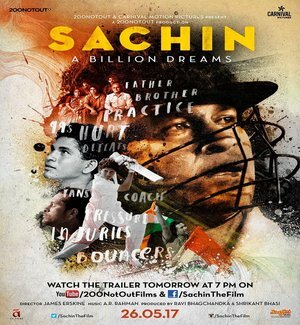 Sachin: A Billion Dreams movie lead star cast is Sachin Tendulkar. Sachin: A Billion Dreams is an indian Biographical, Sports Film of 2017, directed by James Erskine & produced by Ravi Bhagchandka & 200 NotOut Productions. Sachin's Film delivered its best performance on the Sunday with Rs. 10.25 crore. Saturday saw a box office number of Rs. 9.20 crore while there is noticeable dip in the footfalls on Monday. On opening day Sachin Tendulkar film had made decent amount of Rs. 8.40 crores by Mr Adarsh, considering the genre of the film. Sachin Tendulkar's film clashed with Johnny Depp's Pirates Of The Caribbean: Dead Men Tell No Tales on Friday. (1) Relived childhood experiences. Very inspiring and real. Sachin playing with kids was very touching. Most of things we knew but watching it all at one shot with audience is just awesome. (2) Awesome bio pic of sachin sir..!! We are Lucky in born in the era of sachin. (4) Found the biopic on MS Dhoni much better.